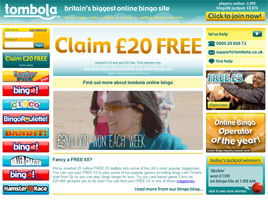 The welcome promotion is featured on the Tombola home page. It’s a first deposit bonus worth £20. To qualify, all a new member has to do is deposit £10. The free £20 appears immediately in the new account. And for those who deposit £25 initially, there is a free bonus of £50—just like trebling one’s first deposit. Licensed out of Alderney in the Channel Islands, Tombola Ltd. offers a downloadable bingo room that has been garnering lots of attention of late. The decades-old company recently became the new official sponsor of an English Premier League team—Sunderland AFC—and it’s web site was lauded at the 2010 Online Bingo Summit in London as the “industry’s best operator.” For quite some time, Tombola has ranked as Britain’s biggest bingo site. Its primary language is English and its main currency is the pound Sterling. More than £3 million is paid out each week in cash. As its name implies, Tombola specializes in Bingo 90, Bingo 80, and Bingo 75. The classic 90-ball Bingo is offered in five separate clubs and 15 online bingo chat rooms. Linkage among the clubs allows prize pools to be enhanced. At the daily 9pm GMT game, for example, there is a guaranteed £1,000 link prize. Tickets for Bingo 90 start from as little as 10p, with strips selling for just 50p. It’s traditional “tombola” all the way, with one-line, two-line and Full House winners. Progressive online jackpots are offered, too. Every aspect of Tombola’s operations is managed in-house. The company creates its own games, not relying on outside vendors, so every room is distinctive and fresh. Suggestions are solicited from players for improvements, which keeps the team of software engineers and designers busy introducing new games and features all the time. Meanwhile, chat moderators and customer service reps ensure that Tombola’s games are fun, friendly, and safe. One major innovation is Bingo Lite, a fast-paced 90-ball game. With tickets starting from just 2p or 10p for a strip, it’s Bingo on a budget. There are four active game rooms available round the clock, each featuring a jackpot of £100. Also available is 80-ball “Seaside” bingo in two chat rooms—Peach and Cream—where players can purchase up to four boards at 25p each and have a shot at the £500 jackpot. Night owls can take advantage of LINK bingo every half hour from midnight to 9am GMT. Three chat rooms are merged, giving players the opportunity to win even more money on the first line and Full House. A number of exciting side games are also offered to add to the opportunities to win, including Bingo Roulette, Cinco, Bandit, and Roller-Coaster. There is even a “bubble wrap” inspired game called Bingo 50. Tombola inserted 25 million free £5 leaflets into U.K. magazines in 2010, so they have been hard to miss. The free £5 can be used to play some of the web site’s most popular games, such as Bingo Lite, with tickets starting from just 2p. Each leaflet contains a unique code which must be entered upon signing up online. The free £5 is added to the new account so that new players can begin enjoying Tombola straight away. Every day the web site offers a free chance at winning a big cash prize with the game called Lucky Pick. Simply start choosing boxes on a 90-box card. Match up winning amounts to claim the cash prize. There are 49 cash values hidden, so the odds of catching a winner are good. Members get six chances to pick daily, plus an extra chance on Mondays and Tuesdays. The prizes range from £5 to £500.